Look! There is a HEXBUG® nano® bug scuttling around in the kitchen! This is such an exciting game and you can never predict where this little bug is going to go! 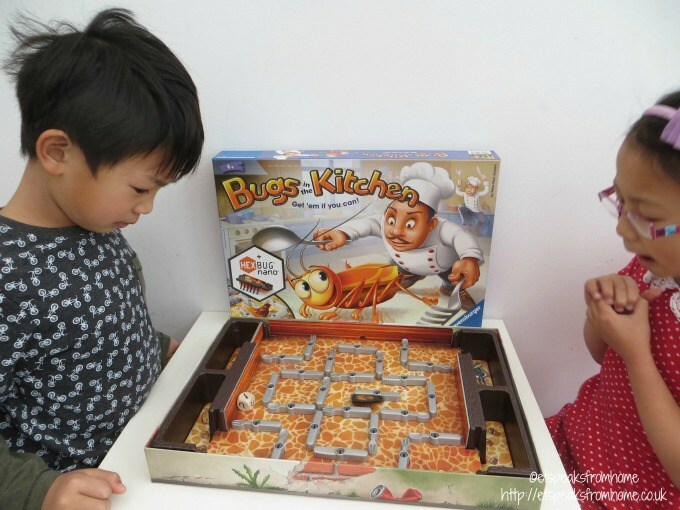 I love the concept of this board game which works so well with HEXBUG®. 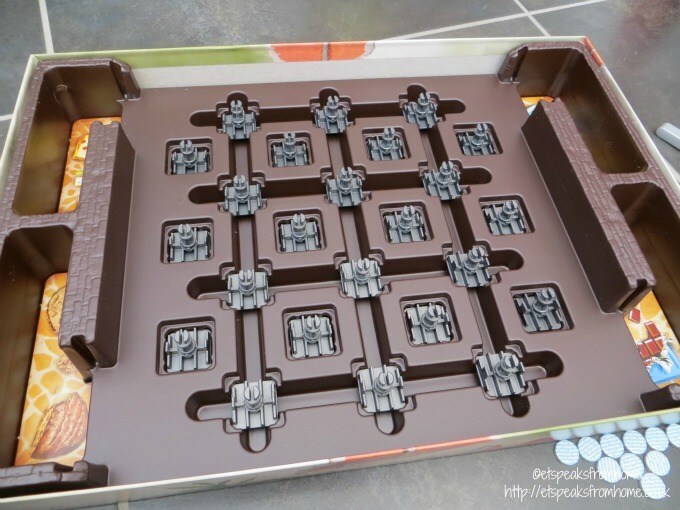 The game board and materials are made with a smooth finish cardboard. The cardboard used is suitably thick and should last for a long time. The utensils and the tray are made from plastic. 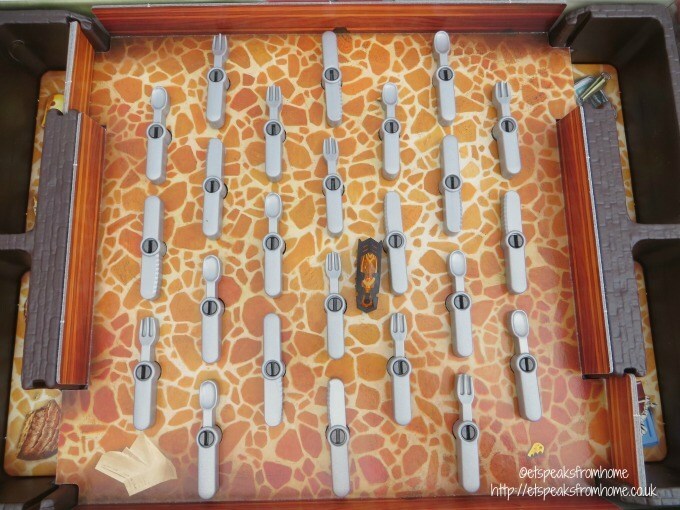 Before playing this game, you need to place all the pegs onto the brown plastic tray and cover it with the game board. Next place all the utensils (as shown in the illustration) onto the pegs and board. Then place the cupboard traps onto each compartments of the inlay. To play the game, each player to choose their trap (compartments of the inlay). If less than four players, barricade the unused trap with a trap door. Turn all the utensils to one of the following starting positions as shown in the illustration. 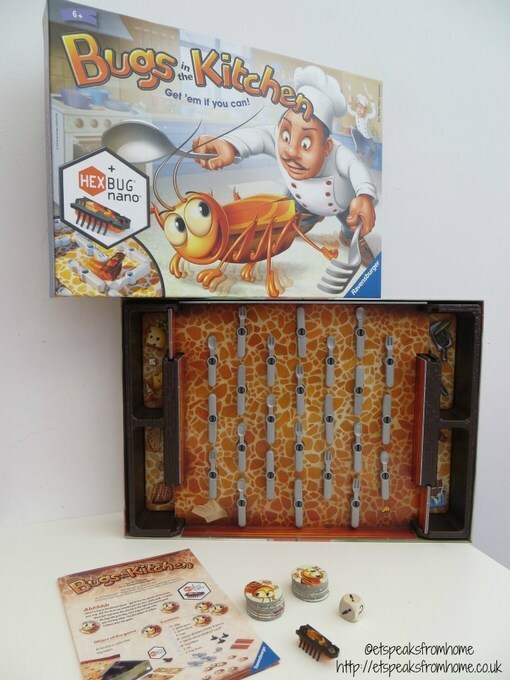 To win this game, be the first player to catch the bug in the trap and collect five bug tokens. The youngest player starts the game. We all find this game very interesting as you have to move the utensils to allow/block the bug to reach your trap. I do find it hard to plot my route and often send the bug into my children’s traps. I end up losing quite badly. Both of them had so much fun and they both love it! I find this game very challenging and engaging. This is definitely an interesting and unique game! I would highly recommend it! It is available to buy in good retailers and Amazon.